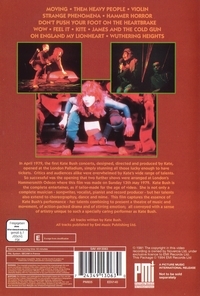 In April 1979, the first Kate Bush concerts, designed, directed and produced by Kate, opened at the London Palladium, simply stunning all those lucky enough to have tickets. Critics and audiences alike were overwhelmed by Kate's wide range of talents. 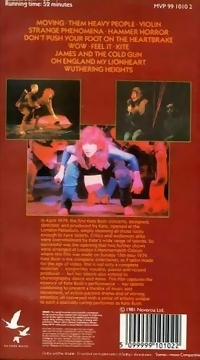 So successful was the opening that two further show were arranged at London's Hammersmith Odeon where this film was made on Sunday 13th May 1979. 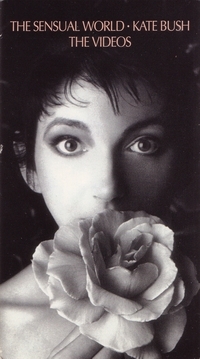 Kate Bush is the complete entertainer, as if tailor-made for the age of video. She is not only a complete musician - songwriter, vocalist, pianist and record producer - but her talents also extend to choreography, dance and mime. 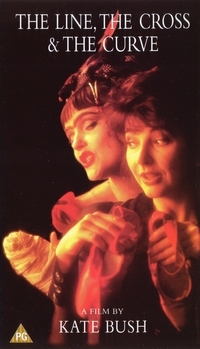 This film captures the essence of Kate Bush's performance - her talents combining to present a theatre of music and movement, of action-packed drama and of stirring emotion; all conveyed with a sense of artistry unique to such a specially caring performer as Kate Bush. 5 - Produced by Golden Dawn Productions; 6 - Produced by Novercia Ltd.
© 1983 Novercia Ltd., except * © 1983 EMI Records Ltd.
and ^ © 1981 Novercia Ltd. 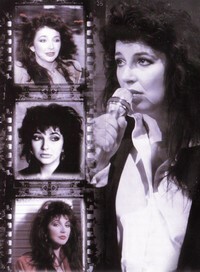 This compilation © 1983 EMI Records Ltd.
(1 to 4) Kate Bush Music Ltd. / EMI Music Publishing Ltd.
© 1986 Novercia Ltd. / EMI Records Ltd. This compilation © 1986 Novercia Ltd. / EMI Records Ltd.
"Stepping Out Off The Page Into The Sensual World..."
All tracks published by EMI Music Publishing Ltd.
under exclusive licence to EMI Records Ltd. 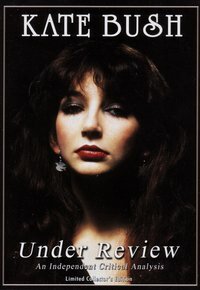 This Package © 1994 EMI Records Ltd.
Limited under exclusive licence to EMI Records Ltd. / (P) 1994 EMI Records Ltd.
All songs written by Kate Bush, and published by Kate Bush Music Ltd.
under exclusive licence to EMI Records Ltd.
arguably the most unique female artist ever. · Rare musical performances never available before on DVD. 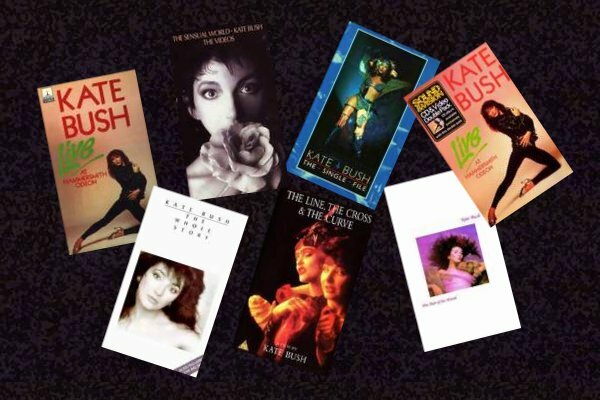 · Obscure footage, rare interviews and photographs of and with Kate Bush from all periods of her astonishing career. 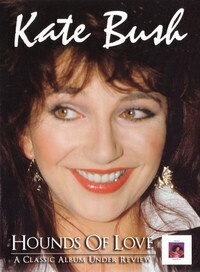 · Review, comment, criticism and insight from: Radio DJ Paul Gambaccini; musician and producer (who worked on several albums with Kate), Moris Pert; writer and journalist (author of 'She Bop'; 'The Definitive Encyclopaedia Of Woman In Rock') Lucy O'Brien; Mojo journalist Phil Suteliffe and many others. 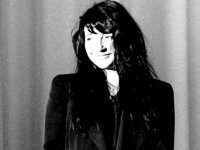 · Live and studio recordings of Kate Bush classics including, Wuthering Heights, Wow, Army Dreamers, Running Up That Hill, Cloudbusting, This Woman's Work, Aerial and many, many more. THE OPINIONS ON THIS DVD ARE COMPLETELY INDEPENDENT. 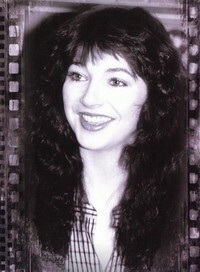 RELEASE OR OWNERSHIP OF KATE BUSH'S MUSIC. Running Time - 90 minutes approx. her management or her record company. 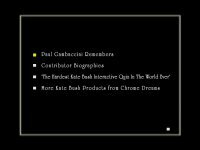 Part of the Chrome Dreams Group of Companies. It's been dubbed the decade that taste forgot, but to suggest the 1980s didn't have its fair share of exceptional music is folly indeed. 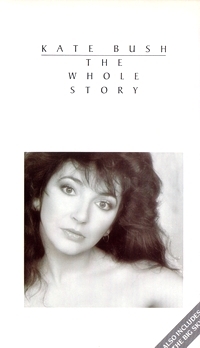 And virtually none was exceptional as that which came from Kate Bush. 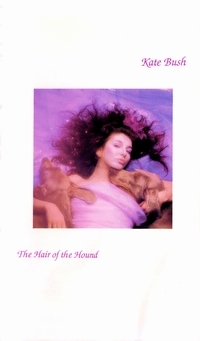 Kate's 1985 album The Hounds Of Love was more than just exceptional however; one could certainly use that accolade in describing her four previous and all subsequent records, but Hounds Of Love was exquisite - for many quite simply the best album ever made! 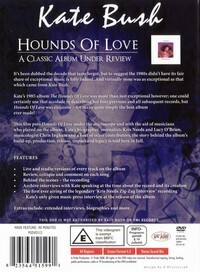 This film puts Hounds Of Love under the microscope and with the aid of musicians who played on the album, Kate's biographer, journalists Kris Needs and Lucy O'Brien, musicologist Chris Ingham and a host of other contributors, the story behind the album's build-up, production, release, impact and legacy is told here in full. · Behind the scenes - the recording. 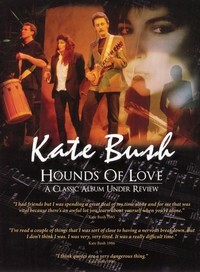 THIS DVD IS NOT AUTHORISED BY KATE BUSH OR EMI RECORDS. "I had friends but I was spending a great deal of my time alone and for me that was vital because there's an awful lot you learn about yourself when you're alone." "I've read a couple of things that I was sort of close to having a nervous breakdown. But I don't think I was. I was very, very tired. It was a really difficult time." "I think quotes are a very dangerous thing."